Tour in class 1 then 2 on some passages, 1 day of 13,5 km from Lexos to Saint Antonin then 17 km from Saint Antonin to Penne. 3 to 4h30 of paddling daily without counting frequent breaks. Overnight at the PAJ (free space) or at the “Camping of the Gorges de l’Aveyron at Saint Antonin Noble Val, all shops are in the village, many restaurants. Visits are recommended. Trek is accessible to everyone, punctuated by canoe sliders. Wild tour on still water on the first day with overnight in the village. 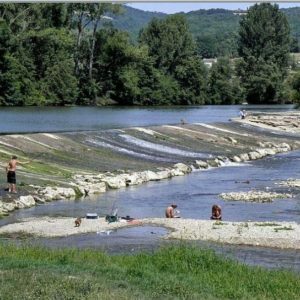 The second day, crossing of the Gorges de l’Aveyron, small rapids and beautiful sites on limestone cliffs, mid day a leisure break at the Manjocarn café or on Ile des Robinsons, 2 café you must not miss. Shuttle back and forth included in the price. Free parking in front of the base to deposit your car. free for child under 10 years old, seated in the middle of two adults on a canoe. 80€ per person in a one-seat kayak. This price includes rental of the canoe/kayaks for 3 days, with paddles, life jackets, two containers per canoe (1 if canoe 3 seats) and the shuttle to Saint Antonin-Lexos the first day at 9:00 AM then the return shuttle Penne to Saint Antonin. One-seated Kayak Taiki, unsinkable and self-draining. Container of 55 litters or 26 litters, simple or double paddles, lifesaver jackets, laminated river guidebook. 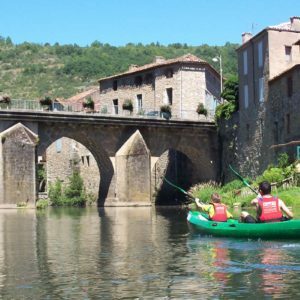 Nature Escapade specialises in Aveyron excursions at Saint Antonin Noble Val since 1983, offering rentals for half-day, whole day, or treks 2 to 5 days. Possibility to customize according to your wishes and timing. More than 120 canoe-kayaks for 1, 2 or 3 people. Our staff offers custom-made treks (booking camping, luggage transport…) Parking, snack bar, sanitaries and restrooms within walking distance from the village. Mountain bike rental and other athletic activities are also available. 9h00/19h00 7days/7 from April to october. We are located in the village of Saint Antonin Noble Val, follow the Aire de camping car, we are just in front of the Chemin de Roumégous. GPS: lat. 44° 9' 9" - long. 1° 45' 5"